Preface. Walter H. Fertl. Foreword. List of Contributors. 1. Global Occurrences of Abnormal Pressures (E.L. Bigelow). 2. The Geology of Abnormal Pore Pressures (R.E. Chapman). 3. Abnormal Pore Pressures: Essential Theory, Possible Causes, and Sliding (R.E. Chapman). 4. Reservoir Engineering Concepts in Abnormal Formation Environments (W.J. Bernard). 5. Chemistry of Pore Water (G.V. Chilingarian, H.H. Rieke, A. Kazi). 6. Pre-Drill Geophysical Methods for Geopressure Detection and Evaluation (T.K. Kan, C.J. Sicking). 7. Well Logging Methods to Detect Abnormal Pressure (E.L. Bigelow). 8. Seismic Prediction of Overpressure Conditions Ahead of the Bit in Real Drill Time (B.A. Hardage). 9. Measurement While Drilling (R. Desbrandes, R. Clayton). 10. Shallow Abnormal Pressure Hazards (A.T. Bourgoyne, Jr.). 11. Relief Well Engineering to Control Blowouts (R. Desbrandes). 12. Abnormal Formation Pressures Caused by Hydrocarbon Generation - Examples from the Rocky Mountain Region (C.W. Spencer). 13. Incremental Gas Resource Potential in Known Fields: A Macrogeologic Perspective (T.J. Woods). 14. Distribution of Hydrocarbons in Abnormal Pressure in South Louisiana, USA (W.G. Leach). Glossary. Practical Conversion Factors. Subject Index. When Fertl's first book, Abnormal Formation Pressures, was published by Elsevier in 1976, the topic was relatively new in book form. In the years that followed, his book became the standard work for petroleum engineers and drillers. The list of major petroleum provinces with abnormally high pore pressures has grown steadily over the years, and with it has grown our knowledge and experience. There have also been technological advances. A new book was required, but no longer could the topic be covered adequately by one person. The problems of abnormally high formation pressures encountered in the subsurface while drilling for petroleum are very diverse, involving geologists, geophysicists, reservoir engineers, drilling engineers, and borehole logging engineers. The acute anticipation of such pressures before drilling has become possible with modern technology. 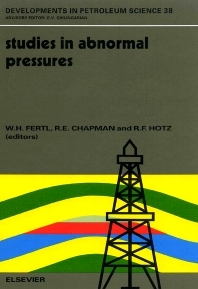 This book treats these developments and covers the following topics: world occurrences, the geology of abnormal pore pressures and the background theory, reservoir engineering aspects of abnormally pressured reservoirs, detection of abnormal pressures by geophysical methods before drilling and during drilling, and their evaluation after drilling. It examines the special problems of shallow hazards from shallow abnormal pressures, and relief-well engineering to control blowouts. It also examines the generation of abnormal pressures from hydrocarbon generation in the Rocky Mountains, and the distribution of abnormal pressures in south Louisiana, USA. The topics are examined from a practical point of view with a theoretical background. There is a glossary of terms, and a relevant practical conversion table. Both SI units and the conventional US oil industry units are used.